Thank you for visiting RBBC online. Our church is a friendly, fundamental, Bible-believing Independent Baptist Church. We would like to invite you to join us. We’re not just a church, but a place to call home. We use traditional, conservative, God-honouring music. We preach and use only the King James Version of the Bible. We believe and will practice the entire plan of the great commission, therefore repentance and discipleship are an integral part of evangelism. We are, therefore, opposed to a high-pressure approach to evangelism. The Holy Bible, consisting of the 66 books of the Old and New Testaments from Genesis to Revelation, is verbally inspired of God, infallible, inerrant, and is of supreme and final authority in faith and life. Satan has always hated the Word of God and has attacked it from the beginning of human history. He continues this attack through the confusion of the multiplicity of the modern versions and their disagreement with each other and with the KJV (compare Mk 9:44, 46; Lu 2:33; 4:4; 23:42; Jn 6:47; Act 8:37; Col 1:14; I Tim 3:16; II Tim 3:16; and I Jn 5:7 in the modern versions to the KJV). The Word of God has been preserved for the English-speaking people in the Authorised King James Bible. There is only one God, Jehovah, an infinite, intelligent Spirit, the maker and supreme ruler of heaven and earth. He is glorious in holiness and worthy of all possible honour and love. In the unity of the Godhead there are three persons as one – the Father, the Son, and the Holy Ghost – equal in the attributes of faithfulness, mercy, longsuffering, goodness, grace, love, justice, righteousness, immutability, omnipotence, omniscience, omnipresence, truth, and divine perfection. The Eternal Word, is the only begotten Son of God who, retaining His divine nature, became a man. He lived a sinless life so that He might be the perfect redeemer of mankind. He was conceived of the Holy Ghost and born of a virgin as the true God-man. His death was on behalf of all mankind and His blood was sufficient payment for all of man’s sin. He resurrected bodily, ascended into heaven, and intercedes for His children now as the believer’s only mediator with God. He will return to the clouds to rapture the church before the tribulation, and then again to the earth to begin His kingdom. As God He supervised the writing of the Word of God. He actively restrains evil, convicts of sin, indwells and regenerates believers at the moment of salvation, and helps with their prayers. He baptizes every believer into the Body of Christ and seals them unto the day of redemption. He guides believers into all truth and it is the privilege and duty of every believer to be filled and empowered with the Spirit. God created all things and the Genesis account of creation is to be taken literally, and it cannot be reconciled with the false teachings of man in evolution. Man was created in innocence and in the image of God but by voluntary transgression fell from his happy and holy state. In consequence, all mankind are now sinners by choice and by nature void of the holiness required by God and inclined to evil, and therefore under just condemnation to eternal separation from God in hell. God also created angels which possess great power and help believers. The salvation of sinners is wholly of grace through the mediatorial offices of the Son of God, who freely took upon Him our nature, that being conceived by the Holy Ghost and born of the virgin Mary, yet without sin, He honoured divine law by His personal obedience and by His death made a full atonement once for all for our sins through His blood. This atonement was not setting an example, but was the voluntary substitution of Himself in the sinner’s place. Having risen from the dead, He is now enthroned in Heaven and He is in every way qualified to be a suitable, compassionate, and all-sufficient Saviour. Sinners must be born again to be saved, a new creation in Christ Jesus is necessary, and it is instantaneous and not a process. The blessings of salvation are free to all through the Gospel and it is the immediate duty of all to accept Him by a penitent and obedient faith. In salvation, perfect righteousness is imputed to a believer by the divine act of God, called justification, and thus secures him peace and favour with God. Sonship is also given, as is deliverance and security from all condemnation. Nothing prevents the salvation of the greatest sinner on the earth but his own inherent depravity and voluntary rejection of the Gospel. Salvation is accomplished not by water baptism or by any other act of man or a church, but by the divine work of the Holy Ghost through the inspired Word of God. Salvation is independent of the law, which was nailed to the cross and given to show man’s sinfulness and to bring him to acknowledge his need for a Saviour. Every saved person possesses two natures, with provision made for victory over the old nature, through the power of the indwelling Holy Ghost. Through the grace of God, all who are born again are preserved unto eternal salvation, eternally secure in Christ, kept by God’s power and sealed by the Holy Ghost unto the day of redemption. At the time of salvation every believer receives eternal/everlasting life as a present possession and all of a believer’s sins are forgiven in Christ. The saved are chosen before the foundation of the world, for God’s purpose comprehends all the means in connection with the end; however, God’s sovereignty does not negate man’s free agency and responsibility. The gospel is for “whosoever”, Christ died for all, and God is willing that “all” come to repentance. Satan was originally in heaven as a cherub of God and he fell with a great multitude of angels through pride. He is now the prince of the fallen angels, the prince of the power of the air, and the unholy god of this world, the open and declared enemy of God and man. Sin originated with Satan and he is the author of all that is wicked and sinful, the tempter and accuser of man, the author of false religions, and the one whom God will judge and cast into the Lake of Fire with all of the fallen angels. True believers in Christ have the victory over Satan and his devils, and over-emphasis on their influence or possession is dangerous and non-Scriptural. Only those who through faith in Christ are justified and truly righteous will be taken to heaven either at the time of their death or at the return of Jesus Christ. The souls of the redeemed will be in conscious bliss awaiting the resurrection, when spirit, soul, and body are re-united in a glorified body to be forever with the Lord. All who continue in unbelief shall be immediately in conscious torment in hell at death to await the second resurrection where they will be re-united with their bodies, appear before the Great Judgment, and then cast into the lake of fire, a place of everlasting conscious punishment prepared for the devil and his angels. 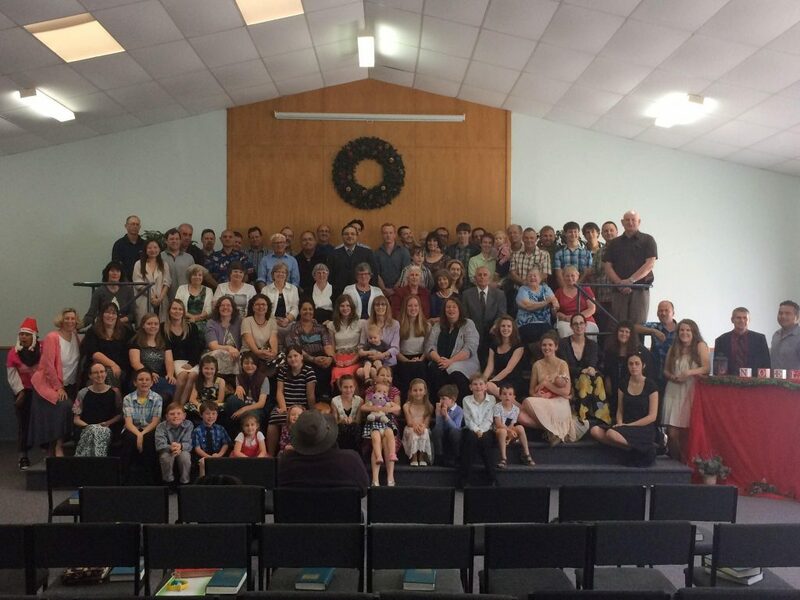 A visible local church of Christ is a congregation of born-again, baptized (by immersion) believers associated by covenant of the faith and fellowship of the Gospel, observing the ordinances of Christ, governed by His Word, and exercising the gifts, rights, and privileges invested in them by His Word. The mission of the church is primarily to spread the gospel of Jesus Christ to every creature by any means that will honour and glorify Christ, to baptize and train those that have been saved, and to help them grow through worship, exhortation, prayer, fellowship, discipline, teaching, and preaching. Each Christian has a Scriptural responsibility to witness of the saving power of Jesus Christ, to have a Biblical home where the husband is the head and the wife and children are in subjection, and to love and pray for one another. The only officers of the local church are bishops (or pastors) and deacons, whose qualifications and duties are defined in the Scriptures. Church government is a theocracy with an under-shepherd (the pastor), governed and supported by the membership, and completely independent and autonomous. Is the one church Jesus gave Himself for, composed of all born-again believers in Christ through the church age and constitutes the invisible body of Christ which fills all (often referred to as the universal church). All who are saved are placed into this body at the moment of salvation (referred to as the baptism of the Holy Ghost in Ac 1:5 and I Co 12:13 and explained in Ro 6:3; Ga 3:27; Co 2:12; I Pe 3:21). Jesus Christ is the Saviour of the body and the Head of the church. This church will not be complete until the Rapture. Are the two ordinances given for the local church. All believers in the Lord should be baptized. Christian baptism is immersion in water of a born-again believer in the name of the Father, and of the Son, and of the Holy Ghost. It is given as a picture of the death, burial, and resurrection of Jesus Christ and typifies the believer’s death to sin, the burial of his old nature, and his resurrection to new life. It has no saving grace and does not have anything to do with being worthy of heaven. Water baptism does not make one a member of the body of Christ, it is a step of obedience for a Christian, and is separate from local-church membership. The authority to baptise comes from the Word of God, not from an invisible unprove-able succession of churches. The Lords Supper, in which the members of a church (and saved and baptized visitors) partake of unleavened bread and grape juice, represents the broken body and shed blood of Jesus Christ. It is a commemoration of the dying love of Christ and is to always be preceded by self-examination. It also has no saving grace and there is no Scriptural requirement on the frequency of the Lords Supper. Civil government is of divine appointment for the interest and good order of human society, and magistrates are to be prayed for, honoured, and obeyed, except only in things opposed to the Word of God. We believe in the separation of church and state, each having definite and distinct spheres of responsibility. The local church is to be completely and entirely separate from the government of the state. All members of the local church are commanded by Scripture to tithe and give offerings through their local church. Their motive for giving should be love. Is the first day of the week (Sunday), the day set aside for the church to worship the Lord. The Sabbath (seventh day – Saturday) was a ceremonial sign between God and the nation of Israel (the Jews), and it will again be observed during the Tribulation and the Kingdom, but New Testament Christians are not bound to observe it. Sanctification is the process by which we are made partakers of God’s holiness which is begun in regeneration; it is the setting apart of one’s self unto a holy purpose. It is carried on in the hearts of believers by the presence and power of the Holy Ghost in the continual use of the Word of God, self-examination, self-denial, service, watchfulness, witnessing, and prayer. The Lord gives varying gifts to each of His believers so that the local church may accomplish the work of God. All believers are called to a life of separation from the world’s ways unto a life of Christian service. This separation is to be personal and ecclesiastical. The believer is to live in the world, but is to separate himself from worldly practices, ideas, and goals that detract from his testimony of faith in the Lord Jesus Christ. These would include the practical areas of clothing, hair, music, and amusements. Each local church is also commanded not to cooperate with or have fellowship with any organisation or church in which apostasy exists, one which is trying to bring about a false church unity through the ecumenical movement, or one which does not follow this Scriptural principle. Is divisive, non-Scriptural, and detrimental to the cause of New Testament Christianity. The current emphasis on signs, experience, and emotion is non-Scriptural, and these things are not evidence that one is of God. The sign gifts of healings, tongues, divine prophecies, and miracles were of the apostles, were unmistakable, and were to authenticate their message until the New Testament was completed. Physical healing is not a guaranteed part of the atonement of Christ, and it is sometimes God’s will for His people to suffer. The baptism of the Holy Ghost is the one-time event where the Holy Ghost baptizes a believer into the body of Christ at the time of salvation. God still heals and works miracles today in answer to the prayers of His people. Every reference to the word “tongues” in the Bible refers to languages. The purpose of this apostolic gift was to break language barriers so the unsaved could hear the gospel and be converted. They were to cease when the Word of God was complete. The evidence of the filling of the Holy Ghost is witnessing and a holy life, not tongues. It is wrong to covet certain gifts, as the gifts are given by the Holy Ghost as He wills. It is non-Scriptural to magnify or excessively speak about the Holy Ghost, as He is not to speak of Himself, only Christ.